Remember those games played on Monday? Throw them out the window. The U.S. and Finland were on opposite ends of lopsided affairs on the World Junior Championship’s opening day. Finland is not as poor as it played against Canada in an 8-1 loss, and the U.S., if you can believe it, wasn’t at their best in an 11-3 win against Denmark. Essentially, neither game told us a great deal about either team. They both come in with a clean slate for this 3:30 p.m. EST contest. Finland should come out fired up in a game that’s pretty close to a must-win. Team USA has to come into the game prepared for a fight and a much more skilled opponent than the one it faced in Denmark. Coming up after the jump, a complete rundown of Team USA’s second preliminary round game of the 2012 IIHF World Junior Championship. The U.S. apparently had a spirited off-day practice Tuesday, with great tempo. The compete level has to remain high throughout the tournament, so having a good practice on a day off certainly helps. The big piece of news coming out of practice yesterday was that Connor Brickley, who was cut on his leg in the Denmark game, was not on the ice. Dean Blais told Mike Morreale of NHL.com that Brickley was doubtful for today’s match-up against Finland. Brickley was due to test the leg in a light morning skate today before a final decision was made, but Blais told Morreale they want Brickley to be 100 percent before he’s back in the lineup. If he’s out against Finland, it gives Brickely another two full days to recover with the U.S. off from game action tomorrow. Blais also mentioned to Morreale that he was going to jumble the lines some, including the dynamic trio of Kyle Rau, Nick Bjugstad and Austin Czarnik. You might wonder why Team USA would juggle as opposed to getting lines on the same page and clicking. However, it’s not uncommon for head coaches to juggle lines in order to find the best mix available. There’s not much time to figure it out and often the best way to get it settled is to experiment in the early-tournament games. The fact that Blais has the confidence to juggle lines against a tough opponent speaks more to the coach’s confidence in his depth and versatility at forward. Team USA has many players up front that can play a variety of roles, which is such a great thing to have. J.T. Miller was slotted as the 13th forward against Denmark, but rose to the occasion in each shift he received. He’s a guy that likely gets more ice as a result of the jumbled lines. Emerson Etem was a guy that played on the “third” line against Denmark and there’s a good chance he gets more top-six minutes after displaying his speed, skill and power against the Danes. I don’t think there was a single forward who played himself into less ice time, so there’s a good chance Blais is going to be able to roll all four lines. Based on his comments to Morreale, however, it appears Blais will be focused more on matching up lines as Team USA will be the home team today. Should be interesting to keep an eye on today. It is also not clear who will start in net tonight against Finland. Blais has said that John Gibson will get some game action in this tournament, but hasn’t specified when or how. Jack Campbell is the proven commodity at the World Juniors, but John Gibson is no slouch. 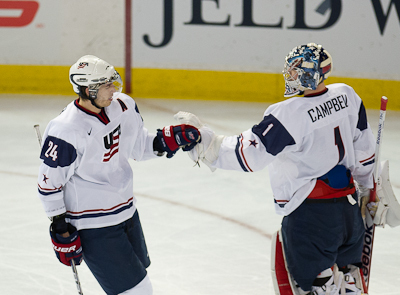 Let’s not forget Campbell was the younger goaltender who unseated Mike Lee at the 2010 World Juniors. I think it’s less likely to see that happen in this tournament, but Blais would likely want to see the younger tender in a game situation to be sure he can go to Gibson in a time of need. It would be foolish to think Finland will be the same team that Canada rolled over Monday. The Finns were outmatched right out of the gate and its young defense was overwhelmed by Canada’s viscous forecheck. It was a crushing defeat, but the kind of loss that enrages the team on the losing end and tends to inspire a better effort in the next game. Granlund has been playing on a line with super sniper Teemu Pulkkinen and his younger brother Markus, who did this once. This is the line the United States has to shut down in order to take control of the game. Finland’s second line has some great ability as well with Buffalo 2011 first rounder Joel Armia, Miika Salomaki and Joonas Donskoi. Then there’s also good scoring depth on the second line with Alexander Ruuttu, 1995-born phenom Alexander Barkov and Miro Aaltonen. This is a team that should score some goals. While the Finns have a plethora of skill, they also have a plethora of youth. There are three 1994-born players on defense and their youth showed against Canada. An injury has also depleted Finland’s back end, as Olli Maatta, a top 2012 NHL Entry Draft prospect, suffered a concussion against Canada. Additionally, Sami Aitokallio, one half of Finland’s terrific goaltending tandem, was injured in warm-ups prior to the Canada game, forcing Christopher Gibson into action and having to stay in as he got shelled. The injuries certainly don’t help, but Finland still has a team that can compete with the world’s best. The Finns never go away and are an incredibly tough out. Expect a much more physical contest and a much more exciting game between the U.S. and Finland. In order to have success in today’s match-up, the U.S. has to establish the physical game right out of the gates. Canada overwhelmed the Finns in both the physical and speed aspects of the game. Team USA is undoubtedly the faster of these two teams, top to bottom. That speed has to disrupt Finland’s puck-possession style game. If the Finns are allowed any time and space, they’ll bury their opponent. The U.S. also has to stay out of the box. If the U.S. finds itself in the box, it had better hope for a much improved penalty kill. Finland is a team that moves the puck well with extra room. Pulkkinen is a deadly trigger man who can score from all areas. He’ll see a lot of PP time with Mikael Granlund. Team USA simply cannot have the type of penalty killing it had against Denmark. Allowing Denmark to go 3-for-3 on the power play is frightening when you consider Finland is a supremely skilled team. The U.S. defensive corps also has to settle into this game much more quickly than it did against Denmark. Limiting mistakes is always important, but particularly so against Finland’s forwards. They’ll capitalize on everything. Good decisions on the back end and supporting the transition with a good first pass is going to go a long way. The U.S. should be able to out-skate Finland, but they’ll have a tough time out-skilling the Finns. Playing with speed and toughness is the best way to try and break Finland early. Team USA’s game against Finland will be both broadcast on NHL Network and streamed live on NHL.com. Here’s a reminder of NHL.com’s streaming schedule. USA Today’s Kevin Allen previews USA-Finland with quotes from Team USA GM Jim Johannson. Here’s USA Hockey’s game notes for today’s contest. Jason Zucker spoke with Minnesota Wild radio about playing for Team USA. IIHF.com has an interesting story on the importance of a team winning its first preliminary-round game at the World Juniors. Only two teams that lost its first game have gone on to win gold in the tournament’s nearly 40-year history. Buzzing the Net has quite literally been owning WJC coverage so far from the Canadian and Major Junior perspective. Then there’s this… The Rally Face. The Worst. Canada has lost Devante Smith-Pelly to injury. BTN’s Neate Sager covers who will have to step up to replace him. Of all the skill players and all of the great forwards on Canada, Smith-Pelly was the biggest cause for concern for any team. He plays like a wrecking ball and can score. As a leader of Canada’s physical forecheck, playing without him and being unable to replace him is a tough blow to Team Canada. Bruce Peter documents the significant injuries that have befallen several World Junior competitors and teams. Better be regularly checking out Puck Worlds for WJC coverage. Great stuff. Chris Ralph is doing a really nice job covering the WJC for The Hockey Writers. Check out his work here. The U.S. National Under-17 Team plays an exhibition game tonight against Canada Atlantic in preparation for the 2012 World Under-17 Hockey Challenge in Windsor, Ont., which opens play Thursday. I’ll have a full Team USA preview tomorrow morning for that most underrated of tournaments. Many future World Junior stars cut their teeth at the U17 Challenge. I’ll have a full review of Team USA’s game against Finland after this afternoon’s match-up. As always, you can join in on the in-game discussion with me on Twitter. I’ll be answering questions all day, so ask ’em if ya got ’em.